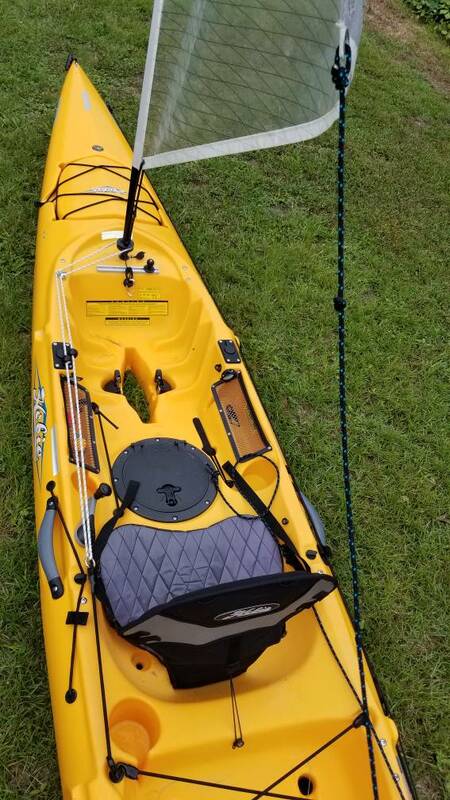 I'm trying to get the Hobie furling kit set up on my Hobie Adventure (not Island). Have not managed to get it working reliably yet. The main problem is that the roller furler piece will not secure tight enough to the mast to prevent sliding up on the mast when using the furler. It seems like the optimum position for the furler is about 1/2" up from the very bottom of the exposed mast. I tried multiple times loosening the four allen head adjustment screws, positioning the furler properly on the mast, then tightening the adjustment screws fully. It feels tight and I can't really move it by hand, but every time after pulling the furling lines a few times, the furler will have worked itself up the mast a few inches until there's enough tension on that little retainer cord to keep it from sliding anymore. After the furler gets that high on the mast, it will fail to function anymore. Also, the front (or forward) screw to mount the fairlead to the hull is not long enough. I managed to get it to hold by removing the washer, and even so it's not holding tight at all, and have no doubt the nut will fall off in little time. I could not find an appropriate size screw at my local hardware store. Anyone know what size screw I will need to find to use there? I have not heard on any issue with the drum not getting tight on the mast. Maybe turn the screws harder or what limit are you doing that to? Is the tool slipping? Hulls can vary in thickness quite a bit and if placed close to a corner they are thick there. The fasteners could be metric, but you could use an equivalent size imperial fastener set available at marine shops or from Hobie Depot in stainless. I had just used my best judgement as to what felt reasonably tight. Today I tried again, and realized I was able to tighten each screw quite a bit more without them feeling too tight. I had also cleaned the mast well, used one of those domed gliders on the bottom of the mast, and even applied some ivory soap on bottom of mast. Was hoping the easier it would turn, the less likely the problem of the furler being pulled up the mast would happen. On the first try, pulling the furling lines one length from bow to stern, the roller furler raised itself a couple inches up on the mast. Enough to greatly increase the angle of the line from furler to fairlead, and also take all the slack out of the retainer clip. So I decided I would tighten the screws all the way since it still wasn't working. I tightened one until it got so tight the allen key started to slip, feeling like it would thread the head if tightened further. Then began tightening the opposite screw to do the same thing, but after tightening a turn or two the whole roller furler busted itself apart. The top half completely separated from the bottom half. I was about to ask if I could just epoxy the furler to the mast, but that's not an option anymore. Have your dealer file a claim for a replacement. That is really odd. The part works like a wedge and should easily snug up. OK thanks, will see what they say. They were supposed to install the kit for me originally but couldn't find a drill when I was there. Also, in the brand new furler package were instructions for the anchor trolley. Ahhhh... Dawned on me last night. I think you have the mast upside down in the sail. There are two pieces. The lower has a slightly larger diameter. Good thought, but was not a matter of the mast being used upside down. 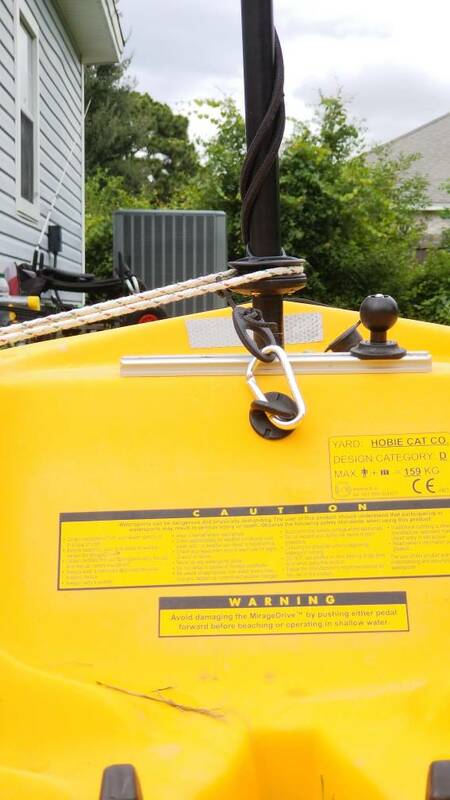 A couple days ago I went back to the Hobie dealer who had the warranty replacement furler. He read the directions and installed it accordingly. He even measured the outer diamter of the mast to make sure it was uniform. Took the Hobie out today, sailed abeam the wind to a marina a few miles away then sailed back. On the way there the furler worked great, used it a handful of times to adjust a partially furled sail as it was pretty breezy. On the return trip as soon as I got out of the harbor, went to unfurl the sail and noticed the furler had ridden up the mast again. As I got into the wind the furler wouldn't work anymore due to the furling lines just slipping. So same problem as before. I'm wondering if I could just superglue or epoxy the furler to the mast in the correct position, to hopefully keep that from happening? Can you post a picture showing the furling line in place? What angle does the furling line approach the mast? Is it perpendicular? I could see the furler assembly slipping on the mast, for whatever reason, but a perpendicular force from the furling line would tend to keep the furler in position vertically, not force it up. Without an upward force I do not see the physics that would cause your furler assembly to raise. On my furler kits I will add that the amount of force I needed to tighten the furler assembly to prevent slipping was right at the limits of the hex head on the screws causing them to disform and I did have to tighten them bit-by-bit over and over in a star pattern. But when too loose and the furler did slip, it did not move vertically on the mast. I guess under sail with heavy wind the sail could be the force pulling a loose furling pully up the mast, at least too the limit of the keeper strap and clip attached to the hull. So I put the sail on in the front yard today, and same problem arose. I loosened each furler nut in a star pattern a few turns from where the dealer had it tightened to, which had slipped previously, so I could reposition it in the correct spot. Got it positioned and tightened the furler up going little by little in star pattern, and probably a couple more full turns on each nut than before. After just once completely furling the sail from the fully open position, the furler slid up a noticeable amount on the mast. I managed to pull the furling line enough (as it was beginning to slip around the furler) to completely unfurl the sail, and the furler rode up the mast to the point where the retaining cord became taught. At that elevated line angle from fairlead to furler, operation no longer works. I once again repeated the loosening and tightening of furler into correct position, and repeated the test with the same results. I took pictures of the overall setup, one of the furler in correct position, and another from same angle showing how much higher the furler sits after completely furling one time. This is in yard sitting in kayak with no wind, and pulling very slight tension on main sheet while furling. I do think where I connect the aft end of bungee cord securing the furling line could be about 3" further back, but tested it while pulling a little more tension (which decreased slippage of line around furler) on furling line with same result of furler climbing up. As a note, I installed on port side due to anchor trolley being on starboard side. 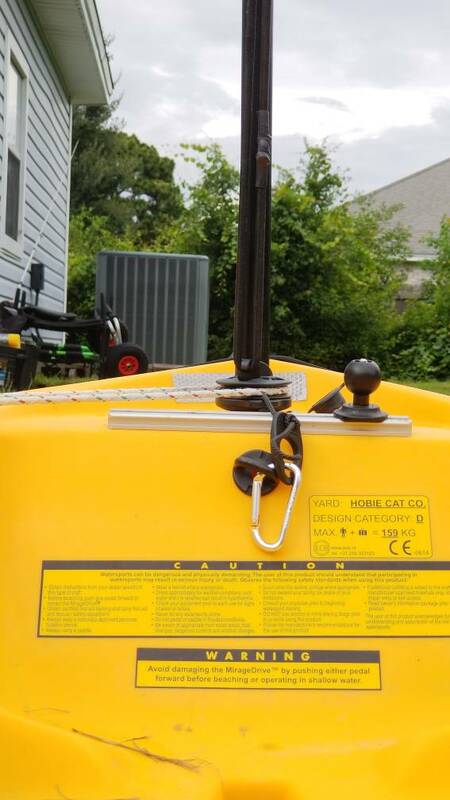 The picture shows the line laying as I operate the furler, but once finished using I can just slide the lines slightly outboard and the tension of the line holds it under the installed factory side carry handle, and gives no interference with rudder knob. Following too, but notice that last this was talked about was in June. For the OP and Matt Miller, any outcome to this as to why? I just bought a sale kit and furler kit and I'm going to make darn sure I really should just make a DIY furler.